A cloud of midges was circling the bikes. We dashed in and out of the hotel to secure our luggage, swatting at our hands and faces, and took off as soon as we were ready. Our first stop was a photo opportunity at the Kylesku bridge, after which we cut off the top left corner of Scotland in a diagonal line ending at Durness. 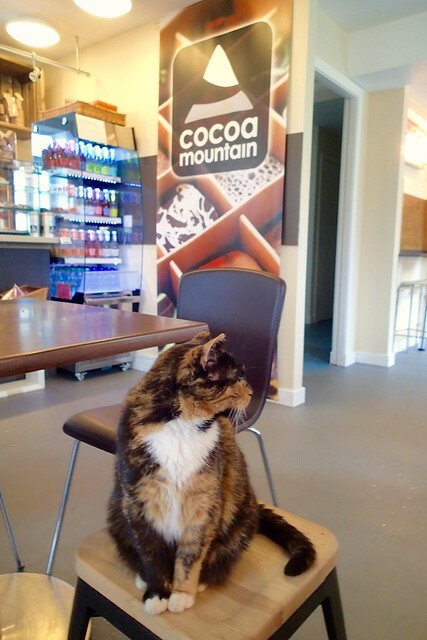 We'd received several recommendations for Cocoa Mountain, and had come to try it for ourselves. They served a fantastic hot chocolate, topped with melted chocolate drizzled over inches of foam, and there was a delightfully friendly cat. Here the rain which had been following behind caught us up, and never went away. It was a cosy rain we could layer against, rather than the downpour of the journey up; softening the edges and the colours so everything was peaceful greens and browns. 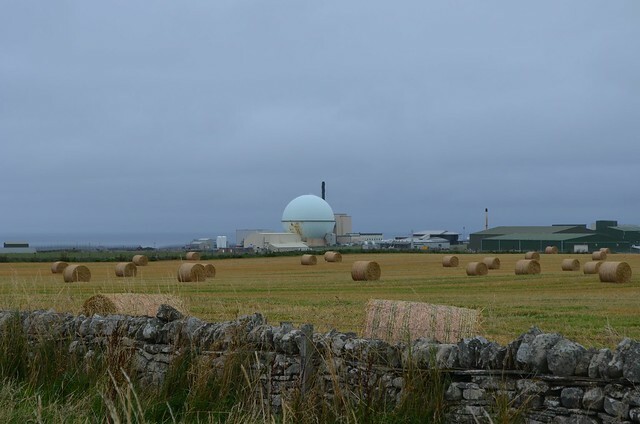 We stopped for sandwiches in Tongue (but not tongue sandwiches) at a friendly pub, and pulled in to a layby for views of the distinctive Dounreay. Our home for the night was Castletown, near Thurso. The town was very grey, the hotel and furnishings dated, but everyone we met was helpful and friendly. Howard and I walked down to the beach, among the remains of the town's flagstone industry, and I had a freezing five-minute swim in a sheltered curve of the bay, watched by oystercatchers. That bridge looks familiar… [checks] Yup! Rory Reid used that when test-driving a classic Mustang against the modern version in the last series of Top Gear. One of the less sucky bits, that! Oh *what* a nice cat! I'm sure I can see Orkney! I can barely see the sea! Perhaps it was just very, very clear? Pesky midges - they are so vicious. Sounds like a fab trip. We were lucky they only became a nuisance on one day! Ah, the glory(?) that is the Highland midge... glad they weren't too much trouble overall! 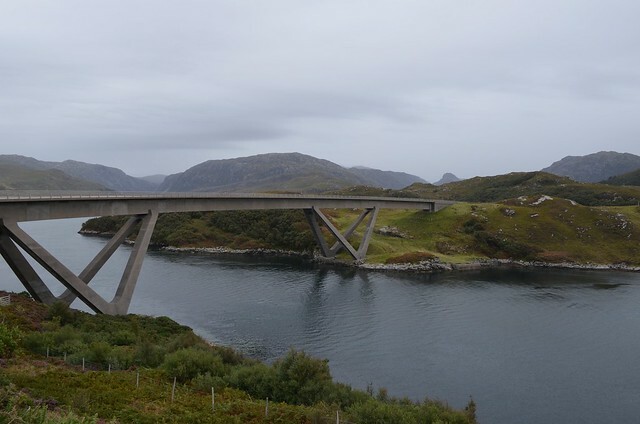 I've always wanted to see the Kylesku Bridge, so I'm a bit envious of that. And what a fine figure of a cat! The bridge was very impressive! And the cat was incredibly friendly, though she didn't seem to do laps or being picked up.